Electric Cigarettes Review - Do Electric Cigarettes work? Are Electric Cigarettes Really Better for You? Electric cigarettes are one of the newest options for those looking to stop smoking. Electric cigarettes promise a lot: a replacement for nicotine addiction, a substitute for the oral fixation, and a harmless substitute instead of deadly tobacco smoke. But do electric cigarettes live up to the hype? "Electronic cigarettes should be absolutely avoided because they clearly have toxic elements," said Dr. Jonathan Whiteson, a pulmonologist at New York University Langone Medical Center. "It is proven now that electronic cigarettes contain toxic elements. 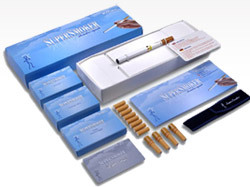 Electronic cigarettes play no role in smoking cessation and don't add to a healthier lifestyle." For all these reasons, we recommend a non-toxic, nicotine-free stop smoking aid instead. Read on to learn more about electric cigarettes. Most electric cigarettes are made to look and function exactly like a real cigarette, except that operate with flavored water vapor instead of actual smoke. An electric cigarette is comprised of a few main components: a battery, an atomizer, a filter that contains nicotine or tobacco flavoring, and a charging component. The filter portion works as an inhaler, and the tobacco flavoring or nicotine is delivered through the act of inhaling, exactly as with an actual cigarette. Those that contain nicotine don't treat nicotine addiction. Therefore, many who try electric cigarettes stay addicted -- but now the delivery system is different. Electric cigarettes are small and easily portable. Because they don't emit smoke you can "smoke" them in restaurants, hospitals and other places where cigarettes are forbidden. However, electric cigarettes (price $60-$150) require batteries and filter packets. The filter packets contain flavoring along with chemicals and (most frequently) nicotine. The cost of replacement filters ranges from $20-$50 per box (a box contains 3-5 filters). Once again, this substitute for cigarettes is nearly as expensive as smoking tobacco. Replacing one addiction with another is not a viable solution. An effective cure for smoking does more than provide nicotine through a different delivery system. If you're serious about kicking the habit, consider an herbal supplement that soothes cravings rather than feeding them with more nicotine.